Yes dear friends quick editing is something you can indulge in as often as you'd like because it is just that...quick. Same as you might spring clean your home or go through your old make-up, quick closet editing can be done several times throughout the year. Quick editing is also not gender specific. Ask my husband; last night he let go of 3 sweaters from high school and a few ratted out t-shirts (once they shrink in the wash they become baby-tees and they gotsta' go!). Today's post will walk you through, exactly how-to, gain that extra space in your closet and freedom in your wardrobe. But first... how do you know it's time to quick edit? I like to quick edit when seasons change (despite the groundhog seeing his shadow, us Florida folks have had and will continue to have warmer days), so I can easily reflect on what I did and did not wear over the past season. Since this information is fresh, I can make more confident decisions on which pieces to give another chance and which pieces it's time to see someone else enjoy. You can also quick edit after a shopping haul or a series of new purchases. If you notice what you've been drawn to lately, you can create a strong sense of what you like, allowing you to evaluate what you no longer connect to. Your editing decisions will feel sound and manifest easily if you are in a good mood. My "groove" is caffeinated and with a good musical playlist. Figure out your mojo and set a good tone for successful decision-making. *Disclaimer:This is not the building of the Taj Mahal so don't get carried away making it perfect. Depending on your day and schedule, give yourself a time limit OR give yourself an open window of time (not all day, it's "quick" people, quick) to complete the job. Either way, commit to the completion. -"what was I drawn to wearing more frequently?" i.e. those repeat offender outfits that find their way on your body more often than not and you hope no one remembers that you've worn twice this week. Or the outfit and look you loved so much you wish more people had seen you in it, so you wore it again. Yes, those are the clothes that inherently should stay in your closet. -"why didn't I wear this?" was the reason circumstance (did I just not have an opportunity to wear this badass sequin blazer), fit (too small, too large, too annoying), function (if you didn't travel then maybe your heavy peacoat didn't get worn), or fugliness (yes, turns out that shirt is just fugly and it's ok that you're just now acknowledging that). -"why am I holding on to this?" do you feel bad that the price tags are still on, yet it's hung in your closet for 2 years now. Maybe you're hoping you'll lose more weight (to me this is the number one reason women specifically, won't let some clothing go. who's to say this ideal, thinner version of you will even like and want to wear this item? let.the.dream.die. At the very least let that dream go to someone who will wear and appreciate those jeans, skirt, halter top from 1992. Start making piles to donate, consign, or give to girlfriends. 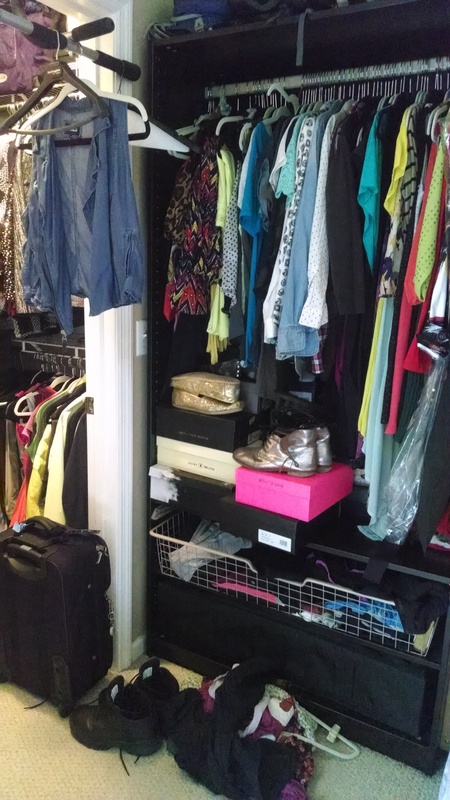 Getting the most out of your closet space requires you to keep your prime real estate, prime. If you have a go-to spot in your closet, keep your go-to pieces there. Since I won't be needing my heavier fall and winter items anytime soon, I grouped them together and hung them in the lower, least convenient portion of the closet. I normally don't divide them this way so I am willing to try this method out to see how it works for me. You can do the same by paying attention to your patterns of accessing your closet. There you have it. Quick editing for quick dressing. I didn't even move my shoes!